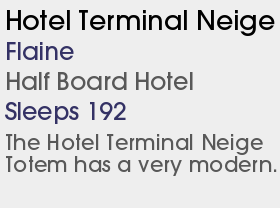 2 Full Board Hotels and 1 Half Board Hotel. WEsay Not a picture post card resort but fantastic snow record, a large ski area and delightful alpine surrounding suitable for all. A great no-frills option. 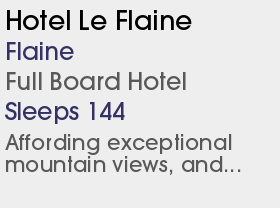 Find the very best ski hotels in Flaine at Chaletline. We have a fabulous choice of ski hotels and ski chalets in Flaine with accommodation to suit a range of tastes and budgets. The beauty of the surrounds of Flaine are somewhat contrasted by the resort’s more functional appearance. Situated on the leeside of Mont Blanc, Flaine is part of the Grand Massif ski area, all of which can be accessed by the same lift pass. The resort sits in the centre of a massive bowl, lifts and slopes radiate out in all directions. Despite the modest altitude, Flaine has a more reliable snow record than any other resort in France. The beginners slopes are mostly within a snowball’s throw of the main resort. Everyone else should head up on the jumbo gondola to Les Grands Platieres at 2480m, the highest point in the area. From here there is a choice of blue, red and black runs back down to the village or to a variety of other mid-mountain lifts. There is also a man-made snowpark with a twist. The Jampark not only features all the usual attractions of a half pipe and boardcross course, but also has a sound system, complete with DJ, and a barbeque. The lift pass is known as a ‘Jambox’ and intriguingly doubles up as a pocket ashtray. Off piste you can try your hand at ice-driving at Renault Flaine, dog sledding, paragliding and snow scooting. On the tamer side of things there is an indoor pool, cinema and indoor climbing wall. The nightlife is more subdued than a lot of the resorts in France, although a few bars doggedly stay open until the early hours. 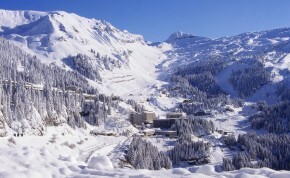 Get in touch to find your perfect ski chalet in Flaine. The defunct hotel Totem reopened after a trendy redecoration by the top-notch Sibuet group, the only regular hotel in Flaine and the first of a new family of Terminal Neige 3-star hotels (others are to be rolled out soon in Chamonix and Avoriaz).